Thank you to everyone who has emailed me or reached out to me via Facebook to send their good wishes. Michelle and I have started a cause on Facebook to promote the Ilya Peckerman Foundation for Wegeners Disease. Please visit the page, which will soon be updated on how you can help and where exactly your dollars will be going. 1. my two musketeers - mom and sister - we do a good job of balancing each other out. When we sense one is down, the others go into overdrive of talking, distracting or just plain goofing around. 2. my husband - words can't even express the calming, patient force he has been. And I do so love his reminders about getting my hair done, going out of the house to work from a cafe, and shopping. The latter part has brought several key items into my life: Joie over-the-knee flat black boots ($200 on sale at Saks.com), a black Herve Leger dress (also on sale $600 at Saks.com ) and a magenta beaded Milly cardigan (yup, on sale $110 at Saks.com). Not bad for a gal that has had a serious case of shopping anxiety for nearly a year! 3. watching Julie&Julia - oh what a charming, well editing, magically crafted movie based on a delightful book (of which I only read 50%). I watched it Saturday with my mother-in-law and once again on Sunday with my mom. 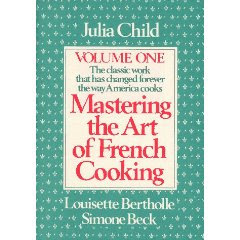 Then I bought Julia Child's Mastering the Art of French Cooking, Vol. 1 . Today, if the force is with me I'll make Filets de Poisson Bercy aux Champignons (a fancy way to say fish filets pouched in white wine with mushrooms). I may even cook in pearls and by 50s-inspired dress from Unique-vintage.com. Before I go, I'll add how I plan to carpe diem today - remember my last post!! I'll carpe diem by working only until 5pm and devoting time to cooking - what I'm certain will become - world famous Filets de Poisson Bercy aux Champignons fait par Pamela Pekerman. How will you Carpe Diem today? Make it your mission to ask yourself that every single morning! I never use this blog to discuss anything that’s personal, unless its purseonal. However, it’s with great sadness that I share the news of the passing of my amazing father Ilya Peckerman. My daddy passed away from complications associated with Wegener's Granulomatosis, a rare auto-immune disease affecting the vascular system. It’s a disease few doctors ever see, so its not always easy to diagnose. My sister, mother and I knew something was up when his intense sinusitis wasn’t going away and with some force and leg work got him diagnosed in late May 2009. With the help of serious medication and a strong will for life, my father was making a recovery and was able to walk me down the aisle in August and enjoy my wedding. After going to work for about three months, he had a relapse in late November. He passed away December 18, 2009 and not only did I lose a father, but a great friend. I’m sharing this with you because from such hardship, my family hopes to help others. Over the coming weeks, Michelle and I, along with our mother, will be launching the Ilya Peckerman Foundation for Wegeners and Vasculitis Disease. We want to bring awareness and increase education about this disease, help those who need medication to fight it, and assist in funding new research. We are in the process of finding out the legal aspects of launching such a foundation and I’ll be relating information as it comes. In the mean time you can learn more about this disease here at vasculitisfoundation.org. It’s not easy putting these words out there to the world, but I’m hopefully that a lot of good will come from it. How will you Carpe Diem today? Have a healthy, bag-a-licious day!